La Sportiva of Italy is without a doubt a mountain shoe builder par excellence from climbing, to mountaineering, to telemark and ski mountaineering. Just look at this assortment of heavy duty boots! Everest no problem. They also make outstanding mountain running shoes. In fact their Akasha was Jeff Valliere's Shoe of the Year 2016 here at Road Trail Run. Their Mutant was not far behind for Jeff and I am also a big Mutant fan for the rough stuff. These 2 brand new Fall 2017 winter and wet running shoes were super light and super cool and in all black a bit hard to photograph! The $180 high top Uragano GTX weighs a light 12.03 oz/346 g. The $160 Tempesta GTX comes in at 11.3 oz/320g so very decent for a Gore Tex mountain runner. Both have Gore-Tex Extended Comfort booties with Gore-Flex so more flexible and foot conforming than typical Gore-Tex construction but not the very latest laminated to upper Gore construction. The scree guard high top on the Uragano is a 4 way dynamic stretch material so not waterproof. This makes the shoe more versatile for warmer conditions and one can always add a gaiter for deep slop. The outsoles have FriXion AT rubber (yellow and red) with the black rubber a firmer rubber. The combination is designed for great grip on snow, trails, and rock. La Sportiva fans are likely familiar with the current high top Crossover 2.0 GTX. It continues in 2017 and weighs 13.05 oz/370 g. At the pictures below a comparison of their very different constructions. The Uragano (left) laces on the outside over the scree guard and tongue. Far easier to adjust on the run, no zippers to free and break, etc... The stretch scree guard and its collar is snug not requiring the pull tab cord of the Crossover (right). The Crossover's "gaiter" is water repellent 4 way stretch fabric so maybe a touch better water repellency but not significantly so than the Uragano's stretch 4 way scree guard. For winter conditions I would pick the touch of extra breathability of the Uragano above the Gore-Tex but testing will tell. Unzipping the Crossover one can see the differences in inner shoe construction with the Crossover (right) essentially have a shoe inside the gaiter, laces and all and the Uragano being unitary, all one piece. Underfoot Uragano, Tempesta, and Crossover all ride on the same platform midsole and outsole platform basics. Not a fall launch, and available this spring, the new Akyra (11.35 oz/330 grams) and Akyra GTX (13.7 oz/330g are essentially lighter variants of the Ultra Raptor. They are designed for the rough stuff, scrambling and running on the steep. 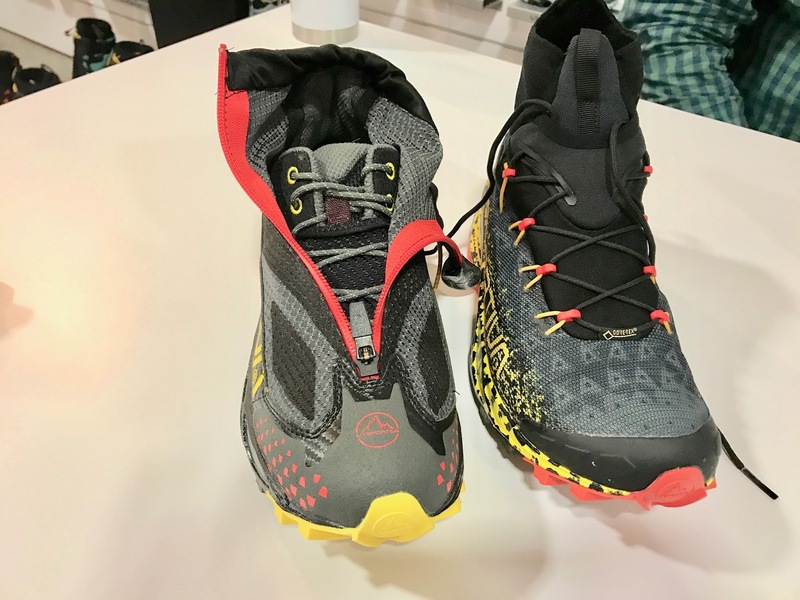 Akyra features aggressive lugs and what La Sportiva calls a Trail Bite heel construction for control and braking on steep terrain. The outsole is the same versatile FriXion XT rubber combination as on the Uragano and Tempesta, so designed for a combination of grip, durability, and shock absorption. The beefier Ultra Raptor has FriXion XF rubber, a very sticky compound. More to come from Outdoor Retailer soon! Follow us below to get the latest. Nike Zoom Elite 9 Review: As Good as it Gets?